First, the Board was under no obligation to explicitly refer to the Guidelines in its decision. Second, the applicant was 16 years old at the time of his hearing, under no disability, and he was represented by a capable designated representative (his uncle) throughout the process. The applicant’s uncle acknowledged having understood and accepted the responsibilities of this designation. In addition, the applicant was represented by his lawyer at the hearing; he questioned him and solicited evidence when required. Third, the applicant’s credibility was not at stake, and the difficulties with which he takes issue in this application for judicial review have more to do with the problems encountered at the hearing with the interpreter than with the applicant’s rights as a minor claimant. As such, the Court finds that the RPD did not err by not specifically referring to the Guidelines, nor did it fail to follow them. Ultimately, this judicial review turns on the alleged breach of procedural fairness, as a determination as to the reasonableness of the sections 96 and 97 analyses depends on whether the refugee claimant’s account was properly understood by the RPD in the first place. As this Court finds that there has been a breach of procedural fairness, this in itself is a sufficient ground to justify allowing the application for judicial review (Ahamat Djalabi v Canada (Minister of Citizenship and Immigration), 2007 FC 684 [Ahamat] at para 4). The applicant argues that he was denied natural justice as a result of two critical omissions by the RPD interpreter at his hearing. He has tendered the affidavit of Ms. Ramya Henry, the legal secretary of his counsel, in order to establish that breach. 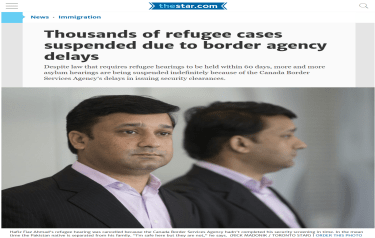 This evidence is admissible in Court, even though it had not been before the Board, as it is required to establish or refute a claimed violation of procedural fairness (Mah v Canada (Minister of Citizenship and Immigration), 2013 FC 853). The omissions highlighted in the affidavit deal with the identity of the applicant’s persecutors and the reason why his family and he were targeted by them-both facts at the heart of the applicant’s claim. As such, the Court must assess whether it can rely on Ms. Henry’s affidavit and whether the applicant’s complaints about the quality of the interpretation were made at the earliest opportunity, as failure to have done so would have resulted in a waiver of the right to object to the interpretation at judicial review (Singh Dhaliwal v Canada (Minister of Citizenship and Immigration), 2011 FC 1097 at para 15 citing Mohammadian v Canada (Minister of Citizenship and Immigration),  3 FC 371 at para 27). As Justice Harrington did in Ahamat, I will consider Ms. Henry to be an ordinary witness for the purposes of this judicial review, and in light of its content, I will accept her affidavit as evidence of the omissions in the translation at the applicant’s hearing. As Justice Harrington explained in Ahamat, the respondent could have either chosen to exercise its right to cross-examine Ms. Henry or, alternatively, to have the audio recording of the hearing examined by an expert of his own choosing, in order to contradict Ms. Henry. It did neither. With respect to the RPD’s assumption that the applicant’s uncle spoke sufficiently proficient English to notice any misinterpretations of the applicant’s testimony, it is based on the mere fact that he has been a Canadian citizen since 2008. This is not sufficient evidence to demonstrate that the uncle’s proficiency in English would have led him to raise any discrepancies during the hearing. Therefore the applicant was well founded to raise that issue at judicial review and it is sufficient to justify this Court’s intervention. Contrary to the RPD’s conclusions, the documentary evidence shows that the Karuna Group is active in Jaffna peninsula as well as in the Eastern Province (IRB Information Request LKA103950.E). The RPD was obliged to acknowledge and distinguish evidence that was contrary to its own finding on that particular issue and its failure to do so also justifies the intervention of the Court (Cepeda-Gutierrez v Canada (Minister of Citizenship and Immigration), (1998) 157 FTR 35). As the RPD’s errors are at the heart of its assessment of the applicant’s personalized risk pursuant to subsection 97(1) of the Act, this application for judicial review will be allowed. No question of general importance was proposed for certification and none arises from this case. No question of general importance is certified. © 2019 Canadian Immigration Lawyers - Maxberger.ca. All Rights Reserved.